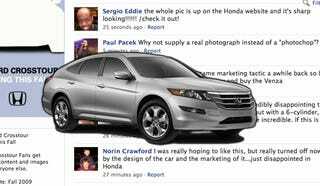 After enduring a seemingly endless litany of complaints regarding the design of the 2010 Honda Accord Crosstour on the Crosstour Facebook page, Honda is finally attempting some damage control. Apparently, it's the photographers fault! Some of the excuses are completely reasonable. For instance, Honda explains that the vehicle is built on the U.S. Accord platform and not the TSX platform, which is why it doesn't look like the European Honda Accord wagon. They also point out it's aimed at individuals (i.e. moms) in the crossover segment and their research shows it'll appeal to them. This could be true. The photos: Arguably, the two studio photos we posted didn't give you enough detail, nor were they the best to showcase the vehicle. There are more photos on the way. Maybe it's like a bad yearbook photo or something, and we think the new photos will clear things up. This is a little hard to swallow. The two pictures are of the vehicle from the front 3/4 and rear 3/4 from different sides. At this point you've done as much as you possibly can to show the car from 360 degrees in two shots. Their post states "[N]or were they the best to showcase the vehicle." We're sorry, but if your vehicle is ugly from 3/4 front and 3/4 back it's just ugly and we doubt more detail is going to change that. In the end, there could easily be buyers for this vehicle, but they're not the ones being targeted in the Facebook campaign. For one reason or another, 5,700 "fans" were convinced they'd get something like an attractive wagon and this crossover isn't pleasing to the vast majority of them. To quote Facebook user Daniel Ruiz II, "I am a car fanatic and a faithful Honda owner, I might not be the target audience for the car, but you shouldn't need to fit in to a certain market segment to find a car appealing." The full statement from Honda is below. Hi, Facebook fans. We're listening, and we want to address a few things you've been talking about over the past few days. 1. The photos: Arguably, the two studio photos we posted didn't give you enough detail, nor were they the best to showcase the vehicle. There are more photos on the way. Maybe it's like a bad yearbook photo or something, and we think the new photos will clear things up. 2. It's not the European wagon: We've seen a lot of comments about the desire for a wagon, but this is neither a wagon nor designed for wagon buyers. We think the Euro wagon is a cool vehicle, too, and we appreciate the feedback… but a version of that wasn't our intention here. That's another segment worthy of our consideration, but the Accord Crosstour, built on the larger, Accord platform, is meant to give you the best of two worlds – the versatility of an SUV with the sportiness of a car. 3. Many of you don't like the styling: It may not be for everyone. Our research suggests that the styling does test well among people shopping for a crossover. 4. You want further details about the Accord Crosstour: We typically can't give you details so far out from when the vehicle goes on sale for a number of reasons, including competitive intelligence and pure availability. However... we hear your frustrations, and while specs on the vehicle aren't finalized, we're trying to get some stuff together that we hope will satiate some of your curiosity and give you more to think about. 5. Honda associates participating in the wall comments: We didn't remove comments out of embarrassment. We removed comments that were posted contrary to American Honda's consumer-generated media policy for associates: We must first clearly state that we are Honda employees and that a posting is a personal - not Honda's - opinion. Eddie forgot to add that, so his comments were removed.